Home prices continue their steady rise in San Diego, but at less than the blistering pace of some metropolitan areas in the Pacific Northwest, amid talk of possible bubble conditions nationally. 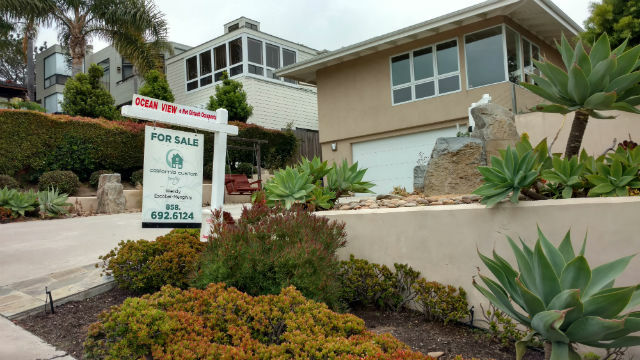 The widely followed Case-Shiller index released Tuesday showed prices in San Diego rose 0.9 percent in April, down slightly from the 1.0 percent increase in March, and were up 6.6 percent over the past year. San Diego’s increase matched the national average in April, and remain ahead of the 5.5 percent national average for the past year. But Seattle and Portland reported much higher increases. Seattle led the nation with a 12.9 percent year-over-year price increase in April, followed by Portland with 9.3 percent. David M. Blitzer, managing director at S&P Dow Jones Indices, which produces the Case-Shiller index, acknowledged concerns that a price bubble may be developing. Zillow Chief Economist Dr. Svenja Gudell said the price increases are being driven by Millennials beginning to buy homes amid short supply. “High demand from home buyers and a limited supply of homes for sale are the main ingredients in the recipe for rising home prices. Millennials are aging into home ownership, the labor market is booming and wages are growing — these three factors are driving demand,” she said. “However, the factors keeping inventory low are more complicated. Home builders aren’t matching historic building levels, and it’s unclear whether rising costs, burdensome regulations, a shortage of land to build on, a lack of construction financing or some combination of all these factors is to blame,” Gudell added.